Cleansing Sprays are such an important part of a spiritual ritual. 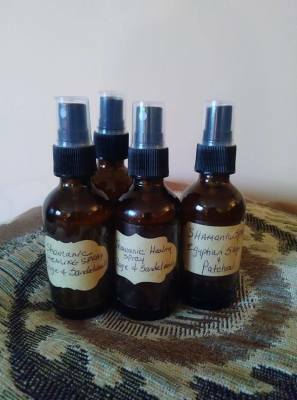 The properties of essential oils deliver an immediate clearing energy to any room, to the aura space, to the hands before commencing a healing or to cleanse tools such as stones or pendulums. I like to spray the healing bed before and after a healing and then fan the space with a blessing. Sage & Sandalwood--Purifying, calming, restorative, cleansing.